Recently when I had been to Kerala (south India), I saw this guy named Thomachan who came to climb the coconut tree. 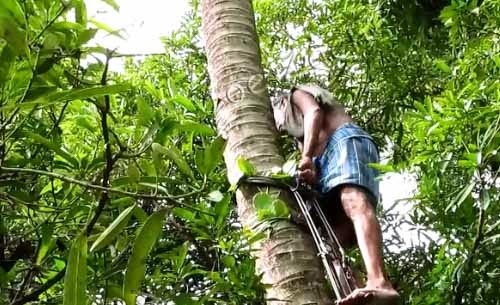 Everyone kept talking about the “tree climbing machine” But what this guy had was not a machine but a contraption which helped him to climb the tree. The design was simple. The contraption gets locked on to the tree when you put your weight on it (by stepping on it) There were two, one for each leg. He carefully strapped the pair on to the tree and climbed up with confidence. 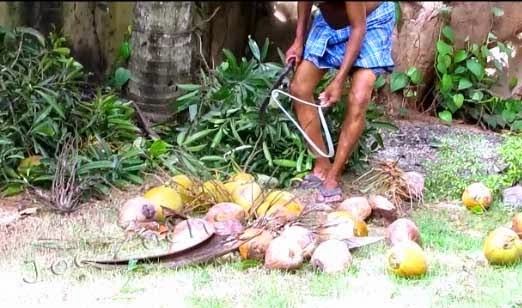 Once he reached the top, he cut lose all the coconut that was ready to be plucked. 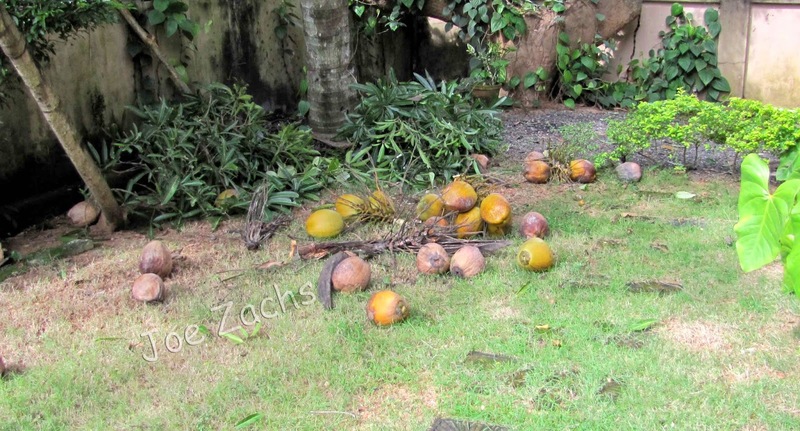 In all we got 32 coconuts from this single tree. OK, in case you are wondering how I did it, this particular tree had nicks carved out in the trunk to enable the toddy tapper to climb up. Now that rang a bell. I remember seeing the same phenomena here in Pune just a month ago. In fact there were two hangers that were used in the crow’s nest here in Pune. Here it is seen from another angle clicked again after a month. Probably the hangers slipped down after a heavy downpour. Have made a small video to show how Thomachan climbed the coconut tree. Wow.. New info for me.. I will definitely share this with my father. We have coconut trees, and if we can get this aid. Very lovely photos and new info for me, too. Have happy end of summer time. I wonder if the crows took aluminum hangers because they are shiny. I can't see they are providing much substance for the nest. I recently had a very old and tall tree removed. The young man who did the climbing used gear that worked in the same fashion as your coconut climber. Engineering. Well, this is very interesting. Crows steal the coat hangers to build their nests was also a surprise. I watched Hawaiians climb coconut trees but that "machine" would make it so much easier. Osprey often use old fishing line in their nests which can cause problems if they get tangled in it. Those crows have an interesting sense of interior design! Amazing. Nevertheless the idea of dwarf palms must be promoted. There are varieties that grow about 6 to 87 feet in an whole life time . No hazard from crows or swarm of wasps. the hangers are funny. crows will pick up anything! at least the tree climber has some equipment to help him! I have seen a similar technique, a little better in fact in Muscat which is used to climb date trees. Nice post, all the best in the blog exchange program! It is always the simplest of tools that are the best. What an interesting post. Even with the 'machine', the whole process looks very dangerous - and that knife! Thanks for an interesting post. The tree-climbing 'machine' is interesting, as is information about the crows using clothes hangers when building a nest. I like the picture of you climbing the tree. Awesome! 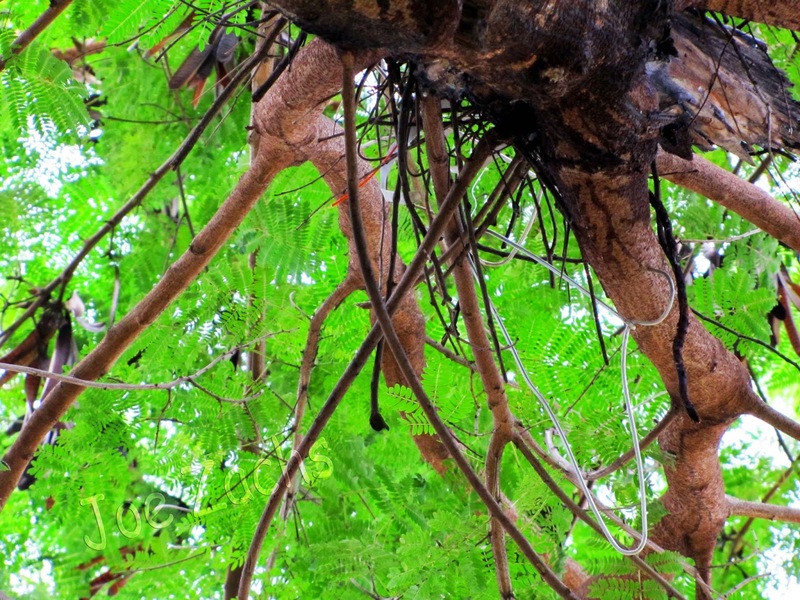 In Bengal they climb with only a thick rope made of local grass bound around the man and the tree. Just slide the rope upwards and jump up the required length ... not cuts on the trees. These men are truly good. Love the innovation, the tree climbers and the crows! You are a keen observer! Liked your black and white tree climbing photo.. I was thinking that looked like a lot of work, but it's worth it for coconuts. Joe, I always learn so much when I visit your blog. Thank you. This was a very interesting post. That was fascinating to see how his own weight held him safely to the tree. I enjoyed seeing the picture of you from years past and watching the video too. Interesting post. I've briefly seen pictures of climbers, but didn't know how it was done. That was really fascinating! I can remember seeing where the tree climber would have a rope tied around his two ankles and around the tree trunk and use that to hoist himself up a little at a time, but I've never seen anything like this metal contrivance. Very smart! Thanks so much for coming by my blog and visiting! Very interesting - I've never seen anything like this before. 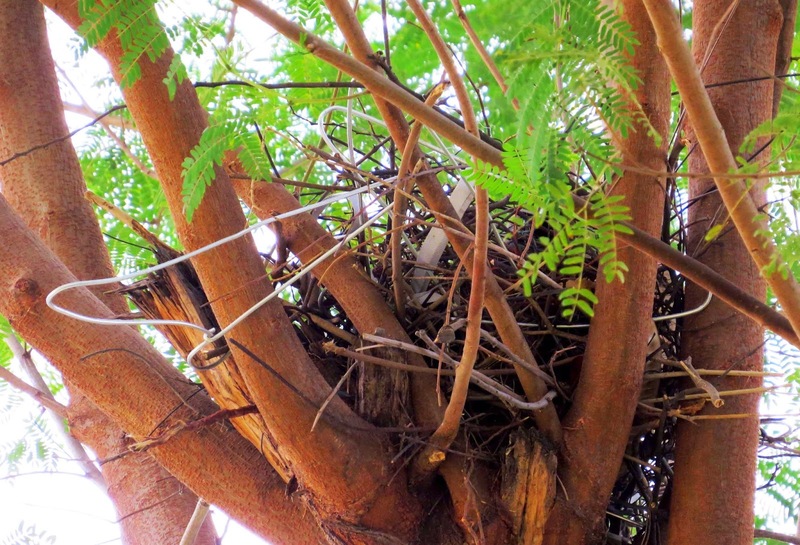 And that is really cool how the crows used the wire clothes hangers in their nest! Clever bird. I have got to get a pair of those coconut climbers in case I ever make it onto Survivor. Oh, those crafty crows! That is a very interesting tree climbing device. We had several rotten trees cut down from our yard a few years back and they just used a rope pulley system, which was fascinating it its own way too. This equipment has played a big role in women,s emancipation. 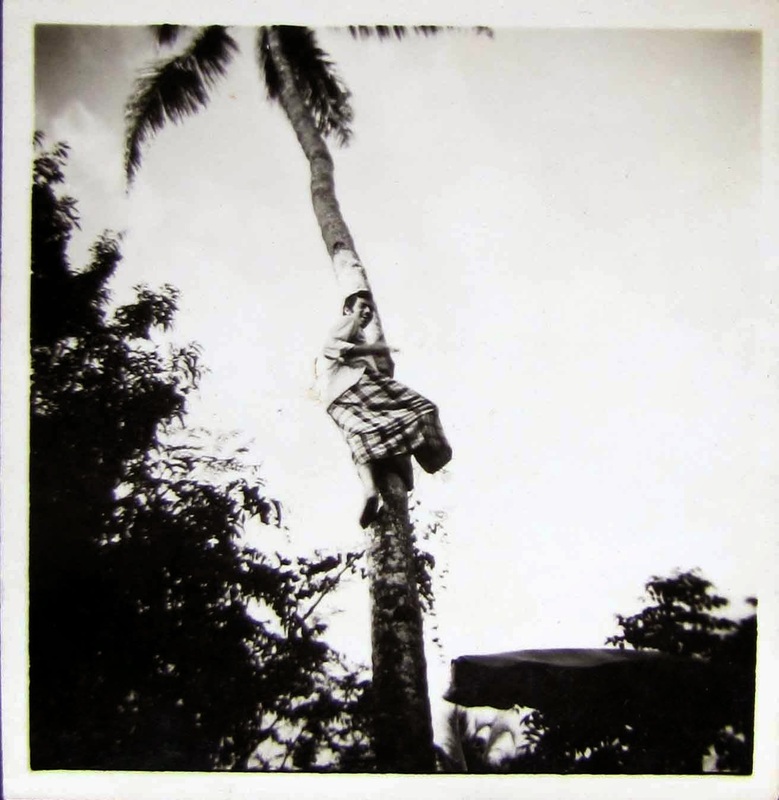 Climbing trees required a strength associated only with males so coconut tree climbing was done only by men. The Kerala govt now trains women free and soft loans the equipment to them. Your picture from 45 years ago is really nice. Followed you via GFC and BLOGLOVIN! PLEASE DO FOLLOW ME BACK! Here's the link so you can follow me EASILY! Follow The Slim Kid Inside on GFC, HERE! That's really, really cool - that contraption is so simple and yet so smart. I had no idea about crows and coat hangers!! Animals are so smart. Such a great idea of the crows to use the coat hangers for building a nest! Fascinating process! Thanks for sharing it. Now that is cool. Thanks for sharing the video to go along. I was in awe when I first saw the tree climber in our garden too. Great pics. Pretty neat contraption to get the job done! It's always so interesting to see how others live life! Haha crows picked up Al. hangers? So surprising. I could visualize a crow carrying a hanger in its beak!